Finally! All the wonderful places to eat in Binondo, all those legendary Manila Chinatown restaurants are now in one map! 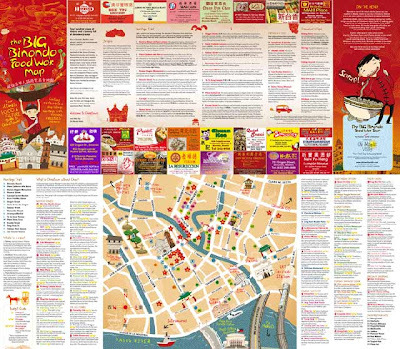 I have to give it to my tokayo Ivan ManDy of Old Manila Walks for producing the Big Binondo Food Wok Map, a must-have map for any serious foodie. In National Geographic's Food Journeys of a Lifetime: 500 Extraordinary Places to Eat Around the Globe, Manila's Chinatown is among the Top 10 Chinatowns of the World (6th to be exact). In fact, established in 1594, it is the oldest Chinatown in the world! Now, you can explore and eat your way through Chinatown on your own two feet! It has restaurant (over 80 food establishments) and shop listings, various cultural attractions and a heritage trail among others. Not only that, the map contains coupons and various freebies you can claim at selected restaurants. And it's just Php100! Purchase your map now from the Bahay Tsinoy Museum, Libros Filipinos Bookshop (Filipinas Heritage Library) or the La Monja Loca Store. Mail orders are also accepted (plus shipping charge). Just e-mail fun@oldmanilawalks.com for inquiries. Oh, did I mention they're given free if you join the Old Manila Walks tours? We just got a hold of copy of the Big Binondo Food Wok DIY map after our tour with Ivan last Sunday. It has lots of freebies! Every travel blogger should get a copy. Yes, it's at Nielson Tower, near the corner of Ayala and Makati Avenue. Hi Ivan. Which establishments offer the Big Binondo Food Wok DIY map? Thanks in advance! i am inluv with u.... well, the blog of course! LOL! anyway, i hope you can organize a small group of people to walk around Binondo and try the Food Wok Map. make sure you do it sometime in July coz i will be in Manila by then. i am hoping to read more from you.. happy blogging! How can i get the map?? ?